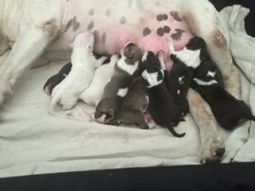 Bull Terrier breeders links and breed information on pups4sale.com.au. pups4sale testimonial: I cant beleive we sold one local, one to Perth and the other one leaves for Darwin on Monday! Just goes to show you how widespread your site is. Thanks again, will most certainly reccomend your site and use it again! There aren't too many dogs like the Bull Terrier, which explains why they are a very popular breed for those who are looking for a unique breed. This muscular, playful dog can be found all over the world and is known for its plethora of energy and its incomparable looks. 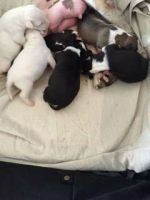 Thanks to Wakatang Bull Terriers for the pictures of Bull Terrier puppies & adults used on this page, and the additional information provided. 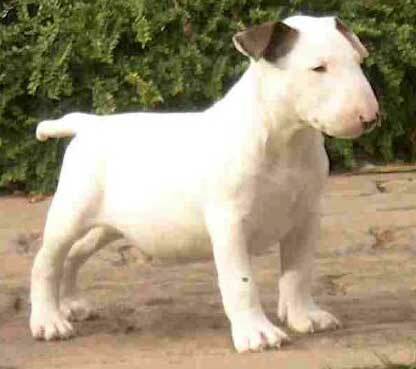 Bull Terriers were originally bred in the mid-1800s to be fighting dogs and to catch vermin. However, once those two things went out of style, they came to be known as great family pets, which is still true today. 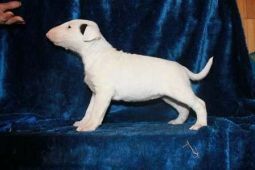 The Bull Terrier is known for a lot of things, but what it is probably most known for is its egg-shaped head. No other dog on Earth (well, besides the Miniature Bull Terrier) has this type of head shape, so it is easy to identify a Bull Terrier one you see one. This breed is also the only one in existence that has triangular eyes. 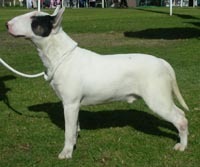 Bull Terriers are medium-sized dogs, but more muscular than most other breeds in this size class. Both males and females grow to be right around 21 inches tall and usually weigh anywhere from 40 to 70 pounds. The coat is very short and harder to the touch than you will find on most other breeds. Just about every Bull Terrier in the world is either going to be all white or colored. White Bull Terriers sometimes have some coloring in their faces. 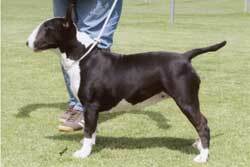 Colored Bull Terriers can be fawn, brindle and a few other color mixtures. Bull Terriers may have an intimidating looking to some people, but in reality they are playful and love to hang out with people of all ages. They were bred to fight other dogs originally, but now they are known for being very gentle and goofy all the way into adulthood. Puppies need to be socialized pretty much right away if owners want to get the most out of their dogs. In fact, only people who have experience with this breed or have taken the time to learn how to handle them should adopt a Bull Terrier. Otherwise, they could end up being aggressive towards other animals when they get older.Bullies love people of all ages, but might be most known for how calm they are around children. They will play with kids when they are told that they can, but the impressive thing about this breed is just how calm they will be no matter how touchy children are with them. Of course, parents should never leave their kids alone with any dog breed, but it is very uncommon for a Bull Terrier to be too rough with children.Bull Terriers are great around other dogs as long as they learned to act properly around them at a young age. 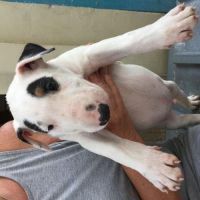 However, the chances of a male Bull Terrier being aggressive goes up if they aren't neutered and they come into contact with another dog that hasn't been neutered. Still, for the most part, this breed isn't as aggressive around other animals as many people assume. Another misconception when it comes to Bull Terriers is that they make great guard dogs. The fact is that they naturally love all people, so there is a higher chance that they would want to play with strangers than actually protecting their home. They can be good watch dogs, though, because they will usually bark at any foreign sounds that they hear. This is not a good breed to be left alone because they enjoy spending time with their families so much. They will not hesitate to eat up furniture and to get into closets if they become bored or frustrated. As long as their owners are with them more than half of the day, they should be happy. Assertiveness is key when training a pup because they can be a bit stubborn and actually seem to enjoy making it tough on owners to train them. This is why it is recommended that only people with experience training this type of breed get one. Of course, anyone who learns how to establish themselves as the alpha dog without being aggressive towards their pets can be a good match.While it is fun to wrestle and to tug ropes with dogs, this is one breed where it is not a recommended way of playing. These types of games actually teach this breed to try to be the dominant animal and can lead to problems down the road. All basic training like sitting, walking on a leash and potty training should be done at an early age. The more a Bull Terrier learns when he or she is young, the higher the chance that they will become great dogs when they reach adulthood. It is a great idea to do some of the training in a group setting to both teach Bull Terriers commands and to teach them how to act around other dogs. Many people who choose to train their Bullies this way find that they are actually more playful with other dogs than a lot of other breeds. They may not seem like the most athletic dogs, but Bull Terriers know how to use their muscle and can run around and play for hours. This is why it is very important that owners make time for their Bullies so they stay physically fit and mentally healthy, as well. Bull Terriers need at least one long walk with a little bit of jogging and some playing throughout the day. If they don't get the exercise that they need, they can become extremely destructive and have the power to destroy houses. This is why this is not a good dog for individuals or families who spend most of their time away from the house. There are many upsides to owning a "Bully" (as they are also known), but one of the bonuses every owner loves is that they don't require much grooming at all. They have a very short coat, so brushing only needs to be done about once a week. They keep themselves very clean, so baths aren't a big issue at all. The one thing that owners should look out for is any type of ear issue. Bad infections can be prevented by using a vet-approved ear cleaner and using it once a week to prevent any type of damage to a Bull Terrier's ears. Though not life threatening, Bull Terriers are prone to eye problems, such as entropion. It is a good idea for owners to have their Bullies' eyes checked at a young age to try to keep these types of issues from getting worse as they get older. Other common health issues with this breed are deafness, hip dysplasia and allergies, among others. While these are serious problems, most Bull Terriers actually live relatively healthy lives until they reach old age. Bull Terriers don't have the longest lifespans for dogs, but they can live 12 years or a little bit longer if they are kept healthy throughout their lives. It can't be understated how difficult it can be to train a Bull Terrier, which is why it is best if they go to owners who know how to train this specific breed. This means people who have experience with Bullies or those who have trained other dominant breeds. It is true that anyone can train a Bull Terrier if they learn how to do it correctly, but it is always best for a potentially aggressive breed like this one to go to someone who is confident they can get the best out of the dog. It is also very important that Bull Terriers have owners who have plenty of time to share with their dogs. This will both help the relationship blossom over the course of the dog's life and it will also make them act properly around people when they reach adulthood. This should go without saying, but people who want to get a pup based on its reputation as a fighting dog should not own one of these dogs. It is a bad way to approach owning a dog and it will only lead to problems down the road.People who have hectic schedules and either know or aren't sure if they will be able to spend enough time with their pets should probably look into getting another breed. Bull Terriers need a lot more attention from their families than most other breeds, so when they have owners who just don't have the time to spend with them, it could lead to an unhappy and possibly destructive Bull Terrier. The Bull Terrier is a one-of-a-kind dog breed that just about anyone would be happy with as long as the dog is trained the right way. They are beautiful animals that have the personality of a 4-year-old, while also having the strength of a tank. They might not be the best dogs for everyone, but those who can get the most out of them end up with pets that have amazing personalities.